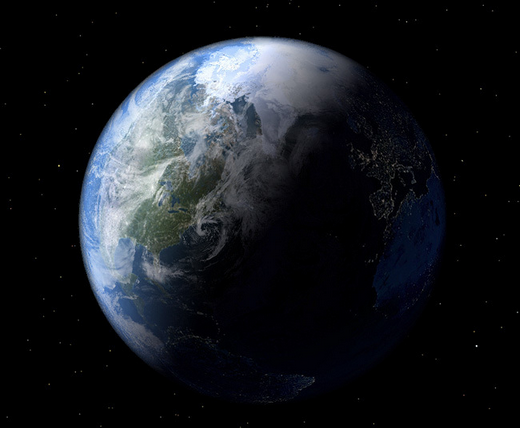 It seems to be becoming more clear that we (as a species) have let the intiative pass to the climate system. Going forward from here, it will not be surprising to see events determining more and more future outcomes instead of people - let the cascading effects begin! Already there has been some (anecdotal) evidence of this just within the arctic circle. A summer depression - unusual in its timing and strength - is partly responsible for the dramatic losses this year. "Arguing that climate change isn't happening will become akin to arguing that the earth is flat." I think you're right, but I wonder what difference it will make if climate change has possibly already become a "self fulfilling prophecy"? Nice analogue to the flatworlders! Indeed. But it will turn out that "God made it melt". Smoking doesn't cause cancer and carbon emissions don't kill ice caps. Never underestimate the staying power of motivated reasoning. Just for kicks I tried the cubic - you get one more percentage point on R^2 and it hits zero in 2015 instead of 2017. Whether that makes a better prediction, I don't know - none of these curves is particularly well motivated. What is clear is that the ice volume is collapsing with amazing speed and unless the trend turns round dramatically in the next few years, we will hit zero very soon. I already, in a debate with a conservative family member, have been directed to links claiming recent climate anomalies are due to god's judgement for various things. I'm afraid that it will indeed, as soon as "it IS melting" becomes undeniable, become immediately "god made it melt." Data for ice extent rather than volume points at a date for an arctic free of ice beyond 2020.
isn't Artic ice driven more by wind than temperature? Meanwhile Antartica is getting colder and its ice cap is growing, except for one small peninsula. I would urge caution is extrapolating to apocalypse with data sets that have only existed for 20 years or so. There are pcitures of US nuclear subs at an ice free north pole in the 1950s. “As the volume of sea ice until recently could not be measured by remote sensing as easy as its extent, numerical models have been made to estimate the ice thickness field between known points, which then is summed up to yield ice volume. The resulting volume over time – plot reveals a much stronger loss of ice than ice extent studies suggest. 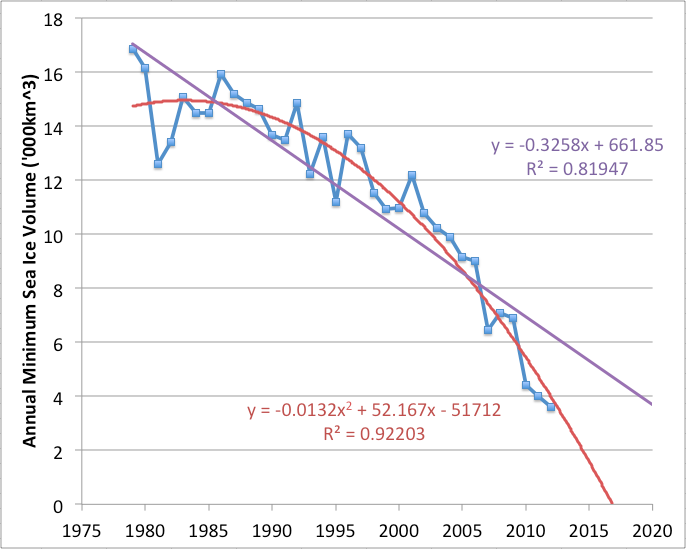 If you make a similar quadratic curve fit of the maximum volume of ice in the arctic spring you would end up with zero ice during the winter about 2035. Could that really be possible? Think about it this way - suppose that the extent was not changing *at all*, but the thickness was on a rapid trend toward zero. Then we would have to conclude that the ice would all be gone when the thickness went to zero, even though the curve fit through the extent would extrapolate to infinity. The point is that if something is changing in all three dimensions, you really need to use the three-dimensional quantity to understand what's happening - in this case that 3/4 of the September ice is gone already. Extrapolating a curve for which we have no particular theoretical justification is of course very dangerous in general However, in this case we only have to extrapolate it a distance that is short compared to the data we have already. Of course, the whole thing is only as good as the thickness estimates - if those had substantial systematic errors, all bets would be off. @jemand: Perhaps the conservative family member "claiming recent climate anomalies are due to god's judgement for various things" needs to be reminded of the two-boats-and-a-helicopter joke. Notice also that the part of the country getting most whacked by drought, both right now, and in the predictions, is not the most liberal part of the country. Weather here in Massachusetts has been wonky, but not particularly bad. We had the first-world-problem of a long-planned lily show put at risk by the warm spring and early summer this year; it was tough, but we put on our brave faces and big-boy pants, and we survived. In short, if this is God's Will, then she's got pretty crappy aim. Lars, I would caution against extrapolating the wintertime sea ice volume far into the future. Currently, the wintertime sea ice volume loss is being driven primarily by thinning of the ice due to loss of multi-year ice. When the Arctic first becomes ice free in the summer, there will by definition no longer be any MYI. So the winter volume would be constrained to what refreezes. Nevertheless, this doesn't imply that a year-round ice free Arctic would follow a seasonally ice-free Arctic. In fact, there have been times where the Arctic was in a steady-state of complete, seasonal melts and wintertime freezes, such as during the mid-Pliocene.